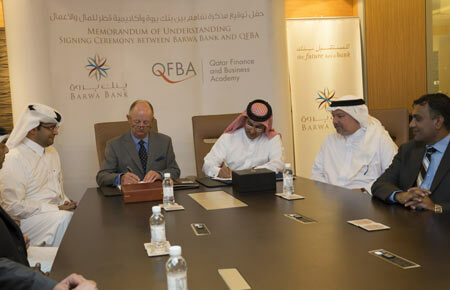 Doha, 03 November 2013 – Barwa Bank, Qatar’s fastest Shari’ah compliant banking service provider, has signed a Memorandum of Understanding (MOU) with Qatar Financial Business Academy (QFBA) whereby QFBA will provide accredited and certified training and development to Barwa Bank employees. The MOU signing ceremony was attended by Mr. Steve Troop, Group CEO, Barwa Bank, Mr. Nasser Moh’d Al Hajri, Chief Admin Officer, Barwa Bank and Dr. Abdulaziz Al Horr, CEO, QFBA on 1st of December 2013 at Barwa Bank Headquarters. Under the terms of the MOU, QFBA will provide Barwa Bank with internationally recognised training and educational services in bank finance, soft skills and business.